Do you know that grammatical errors can affect your blog ranking, popularity, and your personality? Although minor mistakes are ignorable but writing error free articles should be in your utmost efforts. For a non-native English speaker identifying and correcting the grammatical faults is an overwhelming task unless getting other’s help. Most of the people rely on the MS office, but it might be helpful for spell mistakes not for the grammatical and other errors while Grammarly is an advanced tool with tons of features. But its pricey plans may urge you to find a Grammarly alternative. Before we start you should know that Grammarly allows you to select between British/American English, check plagiarism, offers numerous writing styles, suggestions for vocabulary enrichment, find grammar & punctuation errors and much more. Read our in-depth Grammarly review here. Why Grammarly is Better Than Others? Grammarl﻿y is one of the advanced, modern, and perfect tools which offers multiple functionalities at one place and right now, there is not a single tool good enough to beat it. Though there are many services, Grammarly's advanced algorithm works like a charm and suggest all the possible mistakes within a few seconds. So, give it a TRY again and enjoy 7-day FREE trial. It eliminates grammar, spelling, and punctuation mistakes. It suggests related words for commonly used phrases/words, or enhance vocabulary. Instantly check plagiarism to avoid duplicate content. Help you improve sentence structure with examples. So whatever the reason for searching the alternatives to Grammarly, either it is the pricing or the quality or something else here we put together the list of top 10 best Grammarly alternatives. ProWritingAid is a superb Grammarly alternative when your primary concern is the pricing. It is a feature rich tool which is available in both free and premium versions. You can incorporate it easily into your browser so that to analyze the deficiencies in the text when typing in Gmail, WordPress, Facebook, and Twitter, etc. Moreover, it easily can be integrated with MS Office and Google Docs. For developers, they also provide API access so that developers can integrate it with their app. There is no desktop app for free users. Like the Grammarly, they offer plenty of writing styles such as general, business and academic, blog post, etc. You can pick from the US, UK, and general English language style. Using ProWritingAid is absolutely simple. After installing the extension, you will see a small icon which appears whenever you are in the text editor of any site. Now just hover your mouse cursor over the icon and select the option whatever you prefer to test like grammar, overused words, style, clichés, and Redundancies, etc. If you don’t want to do any installation then just go to ProWritingAid and sign up. What makes this tool a close alternative to Grammarly is that it can perform 25 types of tests on your text such as grammar, pronouns, sentence structure & length, transition and vague word, etc. Their writing style feature is very effective that revised the words for improving the readability. 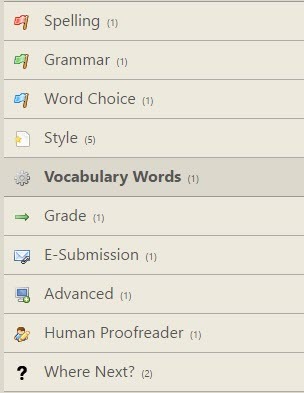 Thesaurus option highlight words and by hovering the mouse cursor you can select from the list of alternative words. The tool is accessible at very cheap rates and just cost $50 for a yearly subscription while lifetime subscription comes in just $175. The plans are supported with 14 days money back guarantee. They do not include any translator, but in our opinion generally, it’s not considered a mandatory component in a proofreading tool. Although they provide plagiarism checker but it will cost you some additional amount. ProWritingAid is an incredible tool with a long list of features and surely worth your money. WhiteSmoke is also very efficient English writing and proofreading tool. It indicates the grammar as well as punctuation, spell checking and writing style suggestions. It is available for all type of devices including Mac, Windows, web browsers, iOS, and Android, etc. The software contains more than 100 writing templates such as Resumes, Condolences, Thank you, Reports and cover letters, etc. WhiteSmoke translator is built on the Statistical Machine Translation and show the translation with the highest probability of being accurate. They support almost 55 languages. The program highlights the words, and by hovering your mouse cursor, you can see the suggestions for grammar and punctuation. It checks the 16 various areas of the sentence such as Fragments, Tense, Incorrect Punctuation and Dangling Modifiers, etc. The tool provides an explanation that why the word is being highlighted and also provide the example on how to deal with that word. It also presents an extensive list of thesaurus which is perfect for building up the vocabulary and finding the alternative of a word which is used many times in your document. Furthermore, it also defines the selected word. With the help of WhiteSmoke, you can find out that if the text is plagiarized or not. This is very helpful if you hire some online writers for your website. The company developed an add-on which helps the users while writing in Outlook, MS Office or other text editing boxes. WhiteSmoke point out the mistakes by Red (for misspell) and green (for grammar) and gray (for repeated) words. One of the cool things that they provide various video learning tutorials related to Prepositions, Auxiliary Verbs, Noun, and Pronouns, etc. For any help, you can Call or send them an email. Whitesmoke costs $6.66/month for "Essential" plan and $10/month for "Premium". The company provides 48-hour refund policy for plans having validity less than 31 days while the other plans include 31 days full refund policy. WhiteSmoke is an impressive tool for English writing solution, but they only offer 4 days trial which is also very limited. As per our experience Ginger is more compatible in terms of usability and reliability than the Whitesmoke. Ginger is another quite brilliant tool among the students, teachers, and bloggers due to its efficient outcomes. Ginger delivers features at greater convenience as it is available for Windows, iOS, Android, Chrome, Safari and Mac. You can use Ginger proofreading tool while typing in the editing boxes such as WordPress or simply go to their site and paste the text. It even helps you while using the search bar of the websites like YouTube. Ginger detects the errors very promptly and highlights them. When you hover the mouse over the highlighted word, then it will provide the suggestion for correcting it. And if you want to approve all suggestion at once then just click on “Approve all”. Like the Grammarly, in Ginger, you can also either select British or the American English. Ginger also translate your document into 40 languages including Chinese, French, Urdu, Hindi, Arabic and Russian. Moreover, you can search the definition of your words through the dictionary and rephrase your sentences for the variety of structure. Furthermore, you can also create a personal dictionary so that the program did not show errors for that words next time. Text reader is another unique Ginger feature which is useful for learning pronunciation, but it is available only in the premium version. There are two versions Free and premium where free version misses some characteristics like errors analysis report, text reader and unlimited grammar checker. We suggest you install their browser extension or desktop instead of trying out their website. Because when you check your text by pasting on their website, then it will analyze only limited words. For an annual plan, Grammarly charge $11.66/month while Ginger cost $7.49/month (offering 40% discount). Ginger is one of the great Grammarly alternatives for Mac and other users but missed the plagiarism tool which facilitates the online publisher to fight against duplication. Furthermore, when you use their synonyms or definition feature by right clicking on the word, then it shifts to the synonyms or definition tab instead of showing up the information in the same tab. It’s not a problem but seems irritating. Grammarly vs Ginger – Which One is Better? The next one in the list is Jetpack WordPress plugin. If you are using WordPress, then you may be using this plugin already. Because this one tool can deliver you numerous benefits such as tracking your site traffic, improve security, free themes and much more. Its proofreading feature works on the same principles as After the dead line. 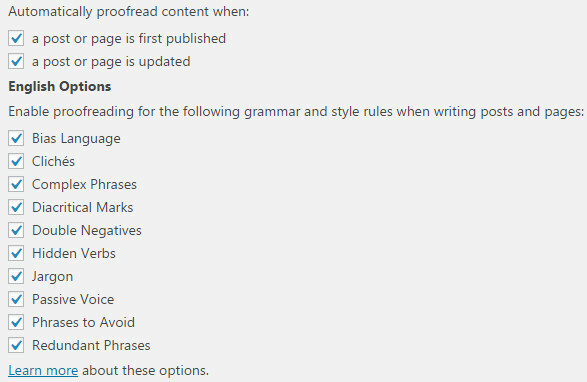 For WordPress bloggers, it is great to have a proofreading tool right in the post editor instead of pasting the contents separately in the text editor of English checker tool. After installing the Jetpack, you will see an icon like this . Start writing or just paste the content and then hit that icon. It will start scanning and mark the words with Red, Green and Blue lines. Red means the word is misspelled or misused; Green shows grammar mistakes while Blue denotes the hint for writing styles. Moreover, it also provides the explanation for the mistakes. You can configure the Jetpack proofreading tool by navigating Users => Your Profile. Just check the boxes for the feature you want to enable. The main feature includes detecting the overused, complex, passive voice and wordiness phrases, etc. Moreover, the tool can proofread the posts written in English, Spanish, Portuguese, German and French. The tool is simple, and you can use all of its proofreading features without paying even a penny. But it missed some major features. You cannot compose the personal dictionary, and it will not point out the misused words written other than English. Also, they won’t let you select from the US, UK, and Canadian English styles. By our experience, it is not as effective as Grammarly or Ginger but is a worthy free tool that can help you to improve your basic writing skills. PaperRater works on the computer algorithms which is affectionately named as Grendel. Currently, there is no extension or the desktop version of this tool. Simply visit their Proofreader and Grammar Check and then put the text in box appeared in front of you and get the report. Their system underlines the words which are misspelled or having grammar problems. The below picture list out the PaperRater features. As the lots of data published every year by online publishers, so it becomes necessary to publish the original data. PaperRater also offers the plagiarism checker like Grammarly. But in a free version, the plagiarism checker only tells the percentage of unoriginality. You cannot find the plagiarized lines or content without subscribing to paid plan. Also, it is integrated with the proofreader tool which means you need to paste the text in Plagiarism Checker separately. They also offer Vocabulary builder. Just put the word in it, and they present the definition as well as various example sentences so that you can get the idea of using that word. Paperrater is similar to Grammarly, but its free version has various limitations. You cannot import the files and also tool is limited to 5 pages. Moreover, their proofreader is a bit complex. For premium subscription, although the software is cheap but it is not an ultimate solution, and you can’t just rely on it. The variety of features makes Slick writer a closed alternative to Grammarly. First of all, use their editor for writing or just paste the text. Now hit check from the sidebar. The tool will point out various element from your paragraphs such as redunda​nt sentences, passive voice, transition words, adverbs and common starting words, etc. The cool thing about SlickWrite is that it has multiple integrated options. When you select a word, a popup appears at the bottom where you can choose to find associate words, thesaurus or the dictionary definition. Also, it includes Google and Wikipedia options to get more information. Readability matters a lot because an article which is terrible to read is almost useless for the readers/information seekers. By using Slick Writer sentence structure feature, you can increase the readability of your article. It will show up the complex and lengthy sentences. As a writer, you may aware about “Flow”. SlickWrite presents graphical details about word length, sentence length, and structural flow so that user can alter the flow rate easily. You can configure the SlickWrite within few moments, just go to its settings and check the boxes for what type of issues you want to find in your text. Among all the qualities the best part of this web-based proofreading software is the statistics. It will present an in-depth aggregate analysis of your contents as well as statistics of phrases and words. So far you can enjoy their services free of cost because currently there is no premium version. Slick Writer is a remarkable tool that includes numerous rules which you can enable or disable at your will. But this lack factor of convenience. Like in Grammarly they allow one click correction where you just have to click on the suggestion for correction. This means you can use Slick Write for only detecting errors. For a non-native English speaker, we suggest you try a tool that delivers easiness for correction such as Grammarly. When exploring the best top 10 Grammarly alternatives, 1Checker surely made a position due to its flexible nature. You can either use the online version or install it on your Windows or Mac devices. It can be integrated with Word and Outlook. The program works on the Natural language processing system which is a combination of computer science and Artificial language. When you click on “Review” after some time, it will show the stats that what are the percentages of Grammar, Spell, and other mistakes. Just close it and start editing. The tool simply highlights the errors and present the tips below words. They also display the explanation of the flagged words on the sidebar. If you don’t want to review the every error then just hit “Apply all” for an automatic correction. 1Checker also provide tons of templates related to business and communications. Just select the “Document Template” and then fill in the blanks appear at the left side. They automatically generate a fine copy of the document. 1Checker also incorporate the translator which is powered by Google and Bing so that you can quickly translate the vague words and phrases. It is a free program like the Grammarly free version to detects the basic mistakes. It can be helpful for eliminating the wordiness, spell errors and structural changes. All in all, it is worthy to use this software as it cost you nothing. OnlineCorrection is a free online program to save you from embarrassment which you may face due to grammatical and spelling errors. It analyzes your contents carefully and then lists out the mistakes. Making correction is very easy as wrong words are indicated with different colors. The tool also provides the suggested words. OnlineCorrection search for grammar, style, spell, punctuation and duplication of words in your text. There is no way to find the originality of the contents. Also, they do not offer any premium version of the tool. Along with the English correction feature, OnlineCorrection also supports multiple languages which is the best part of this checker. The software can proofread any text which is written in German, French, Spanish, Italian, Polish, Portuguese and Russian. OnlineCorrection is a simple tool to proofread the article before publishing or presenting to anyone. It might be a considerable option if you are searching free Grammarly alternatives. Also, there is no need to sign up so you should give them a try. HemingWay mainly focuses on increasing the readability of the post. You can use their online version or download the desktop app. But you have to pay $19.99 for the desktop version. Besides, it can be used in WordPress or the Medium editor. They also present the readability grade. When you paste text, it will highlight the phrases with different colors. The tool tells you which sentence is hard to read, and also it provides the suggestions to simplify the words. The Hemingway editor also has multiple options like headings, bold, italic, bullets and inserting the links, etc. While on the other hand, Grammarly editor did not allow the user to insert the links and if you paste a text having hyperlinks. The tool also denotes the passive voice from the sentences. In our point of view, Hemingway is not an effective tool for grammatical errors. Although, it’s a great tool for enhancing the readability of your articles. So where does it fits? You can first use some advanced tool like Grammarly and then pass that article through the Hemingway so that your article will not only free of grammar errors but also composed in a way which is easy to read. If you are searching for a web-based proofreading tool, then Reverso is for you. They developed an extension for Chrome users, but there is no desktop, Android, or iOS app. For using online version just go to R﻿﻿e﻿﻿verso and paste the text. It may not find the advance errors but good for finding the basic mistakes. So what makes it a similar software to Grammarly? It has integrated dictionary, conjugate and synonyms options. For using these first of all select text and then choose the option. It is good if you don’t like to open different sites to find the definition or synonyms of the specific words. Reverso support multiple languages which mean it can translate your data into any language that they support like German, French, Arabic and Russian, etc. If you want to improve your grammar skills, then you should visit their well-organized knowledge base where they put the information about tenses, verbs, adverbs, prepositions and many more topics. They also maintain numerous topics about French grammar rules. You must use their Chrome extension if you are facing language barriers in reading articles. After installing extension double click on any of the words appeared on any web page to translate it into the 11 different languages. Similarly, you can translate the sentences. As per our personal experience, this tool can be used for constructing the variety of sentences but for proofreading you can’t just rely on it. Moreover, a little problem with Reverso that it can only check 600 characters. So for simple proofreading and most importantly if you are suffering the language differences then surely it makes sense to use. According to our experience, Prowritingaid and Whitesmoke are among the most potential Grammarly alternatives. But personally, we suggest first try to use Grammarly as it is the most advanced tool which can detect simple to advanced 400+ grammatical mistakes and also proves good for vocabulary enhancement. Moreover, it has most friendly interface than any of the tool in the industry right now. Do you have any best Grammarly alternative in your mind? If so, please share in the comments section below and let us know which tool you use to correct writing mistakes? Thanks for the great article. I am using free version of grammarly and tryng to go for paid one. THis will help! Can you have a look at typely.com? It’s more like a linter rather than grammar checker but a very good one. Yes Romemo, typely.com is a good service too but slightly different. Thank you, Zahra, for letting us know your choice. ProWritingAid is totally an incredible tool. Appreciate your choice. Thanks for sharing awesome post! I was really upset by the high rates of Grammarly, now I have found a good alternative Ginger by your this post. Thanks Asad!